A winter storm watch, high wind watch and coastal flood watch were posted Sunday as a major nor’easter was forecast to bring heavy precipitation, high tides and thunderous surf to the Shore area. 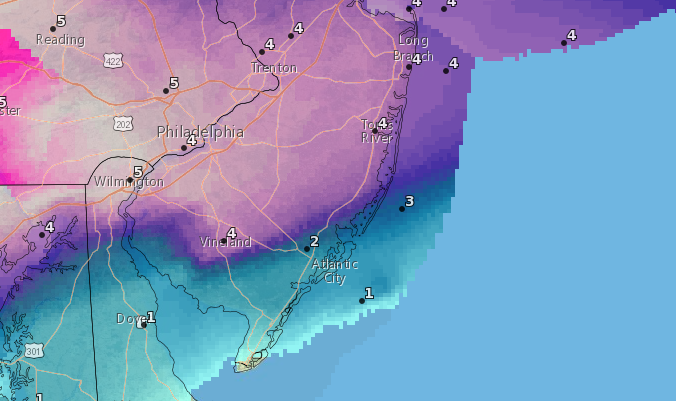 Most meteorologists were predicting between 6-12 inches of snow will fall in Ocean County, with the northern portion of the county receiving the highest snowfall totals. Rain and sleet will mix with the snow close to the coastline, but will eventually turn to all snow, according to the National Weather Service. Timeline: The storm will begin as snow before 5 a.m. Tuesday, the NWS said, then mix with sleet during the morning rush hour. The sleet could be heavy at times. The mixing will continue until about 8 a.m., when the precipitation will turn back to all snow. Winds could gust to more than 50 m.p.h. during the day Tuesday. The precipitation will – mostly – end by Tuesday night, though lingering snow showers could continue into Wednesday. The winter storm watch and high wind watch are in effect until 6 p.m. Tuesday night. The coastal flood watch is in effect until 3 p.m. Tuesday. Ocean County’s final snow totals are still in flux, dependent on whether the storm comes in closer to the coast (meaning more rain will mix and bring down accumulation) or farther away, allowing cooler air to keep snowfall more steady. “I’m using a Bridgeton to Hammonton to Toms River line as the cut-off for the heaviest snows, with the most from that line north and west,” Press of Atlantic City meteorologist Dan Skeldon said on his social media page.